My husband and I have been married since 2006 and are currently living in West Michigan (it’s like it is it’s own big town in Michigan). We were both born and raised in the mitten state, met in college, and have a daughter, Mazy Grace, born in 2015, and have two babies in heaven. In 2000, when I was 17, I was diagnosed with a rare heart condition called an anomalous left coronary from the pulmonary (ALCAPA). A month later, I had open heart surgery to correct the problem. At that point, my mitral valve was leaking just mildly, so doctors did not want to touch that valve because most heal themselves after the surgery. Well, the leaking in my mitral valve had increased to a moderate/severe stage, and by 2010, it would be very risky for me to have my own child. Dan and I felt it was not worth risking my life, which meant we had to grieve what we would not have. Our very own children. Little did we know that as we were grieving this “loss,” God was working in the hearts of our friends, Tim and Brenda. On October 10, 2011, Brenda offered to carry our baby(ies). After much prayer and tears of humbleness at their offer, we accepted. After a long journey in planning for this process, we found out Brenda was pregnant on September 5, 2012. Though, that same day, Dan also learned he had been let go from the church he worked at as a youth pastor because of some decisions we had to make around the gestational carrier process. Then three short weeks later, Brenda had her first ultrasound and we learned that God had taken our two babies to their eternal home. It was extremely hard to let them go, but in our hearts we believed God was sovereign and would continue to work His plan to perfection. In May of 2014, at my routine heart checkup, we found out that God had miraculously healed my heart enough to the point that my heart was healthy enough to carry a child. God had restored our hope of having our own children, in such a personal way. A month and a half later, we found out we would be having a child in March 2015! Words could not even express the joy and humility we felt – that God would choose to act in this way in our lives. On March 17, 2015 at 6:52pm, our baby girl, Mazy Grace was born! She was 8 lbs. 2 ounces and 22 inches long. Our little miracle. Even though my pregnancy and birth couldn’t have gone any better, I went into heart failure days after her birth. It was a trying and scary time for us and our families, but a year after having her, we received the news that God had healed my heart ONCE AGAIN! Unfortunately, in May of 2017, we learned that my heart had once again declined. We were set to move back to Michigan, closer to family in June, so we waited to meet with a cardiologist at the University of Michigan (recommended by my cardiologist). After many tests, I finally had my open heart surgery scheduled for November 30, but my heart proved it could not wait that long. It was bumped up to October 20, where I had a right thoracotomy, to repair my mitral valve. Five days after being home from the hospital, I landed in the ER and was flown via helicopter back to the University of Michigan, with yet again, a failing mitral valve. The sutures had blown, after the tissue surrounding the repaired valve, calcified. It was a very uncertain time for our family, knowing that I was not even healthy enough to have another open heart surgery, but needed one desperately. After many tests and God’s mighty healing hand through a very difficult time, I found myself once again on the operating table on November 6 for a SECOND open heart surgery, this time through the sternum, to replace my mitral valve with a cow’s valve and to repair my tricuspid valve. It was a bumpy road after those two surgeries, especially after spending 16 days in the hospital for that second surgery. Yet God has proven Himself faithful, time and time again. Even when my medical diagnoses were not good. We are humbled at the healing God has given me, and are trying to live every moment in the grace God gives us daily, as we seek to follow Him and the call He has put on our life. Part of that call for me has been feeling the nudge to write a book! I started it back in 2014, when I was pregnant with Mazy, though the real dream started years and years ago. I have always enjoyed writing, even back when I went to a young writer’s convention! That call definitely wasn’t small and I knew I wanted to write a book, but I never imagined it being about MY life. God has given me a story to tell (like He has done for everyone) and I just felt I could not keep it silent anymore! 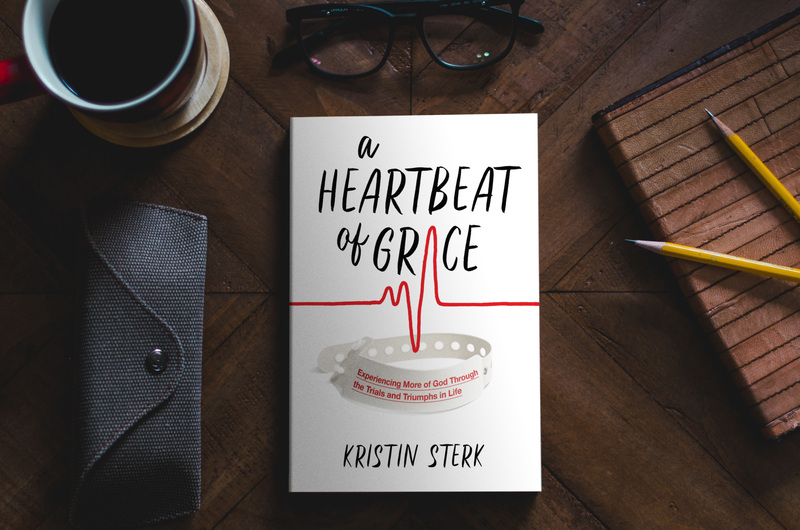 And now, a book has been born out of that dream…A Heartbeat of Grace. It is available to purchase HERE from me (where I am able to sign it if you’d like – just let me know) and on Amazon! And I will say…I’m not sure it’s my last book either…but nothing is in the works :). By all means I am no professional writer. Don’t expect a grammatically correct post because I blog like I speak. I actually enjoy “editing,” but clearly I do not practice those hobbies on this blog. I want each post to be as real as if you were sitting across from me in a coffee shop. So pick up that cup of your fav, and join me on this journey! That is a little bit about me – I would love to hear more about YOU! I don’t want this to be a one-way conversation, so feel free to comment or send me an email at kristin.sterk@gmail.com so that I can get to know you!